A while back I posted about the problems many homeowners face with regard to areas of their homes that they simply aren't able to use very much they're not able to keep them at a comfortable temperature. I have a confession to make: I am one of those people -- or should I say, I was. I don't have a 4 seasons room, or even a 3 seasons one. I have a bonus room. Bonus rooms, or my favorite acronymn used to describe them F.R.O.G (Finished Room Over Garage), are a somewhat newer phenomonon, but the concept is ages old: convert what would otherwise be unused and unconditioned space over a garage or other portion of your home into "living" space by insulating, drywalling and adding some kind of HVAC into it. My FROG is above the garage and is approximately 10 feet by 20 feet with sloped ceilings and a window at the end. With a young family we have turned it into a play room for the kids - an area of the house that the toys can live so we have some hope of keeping the bedrooms and other living areas approximately clutter free. There was problem, though - it was almost completely unusable because of the temperatures in the space. When we first moved into our home we had a single furnace and air conditioner that served the entire home through a single duct system with a single thermostat located in the living room on the main level. There was a single 10 inch round duct that ran from the furnace into the attic where it split into a ductopus to serve the three kids' rooms, a bathroom, and bonus room. Thankfully we moved in late summer because the kids soon had relief from the 80 degree temperatures that were the best we could achieve when the days were warm. The solution for the kids was to increase the size of the trunkline to the second floor and add a zoning system with a thermostat located on the second floor. By adding the ability to sense the temperature on the second floor and direct cool (and warm) air there as needed we had reclaimed that living space (or at least didn't have to feel guilty making our kids sleep up there). The bonus room, however, didn't fair as well. You see, for the most part, bonus rooms like their 3 and 4 season room breathren exist as a bit of an appendage on a home. As a result they are literally surround by heat load or loss surfaces that lead to wildly different heating and cooling requirements than anywhere else in the house. Think about this for a minute. The room you're sitting in right now more than likely doesn't have more than 3 surfaces that are losing heating (or gaining it, depending on the season). You probably have a wall or two and then either a ceiling or a floor that is touching the great outdoors or otherwise unconditioned space (attic, garage, etc). The rest of the walls, floors, and ceilings are likely shared with other rooms or conditioned spaces and represent no heat loss or gain in the room. So, when we have a bunch of these rooms touching each other and none of them has a terribly large loss or gain we can usually stay pretty comfortable with a single thermostat and a single duct system. However, a bonus room has almost all of its surfaces touching the outside world. In my case I have a door and about 10 square feet of wall that is shared with my daughter's room. The rest is a floor over the unconditioned garage, walls that are touching a vented knee-wall attic, ceilings with the same, and a window to top it all off. What had the builder of our home done to accomodate what is a heat load and loss wildly different than the rest of the second floor? Two supplies of 6" flex that come out low on one of the walls and a single return. At least there is a return. Needless to say, it isn't nearly enough and even if it were, the system only runs when the 2nd floor thermostat calls for heating or cooling. So, what's an HVAC guy to do when faced with a comfort challenge in his own home? 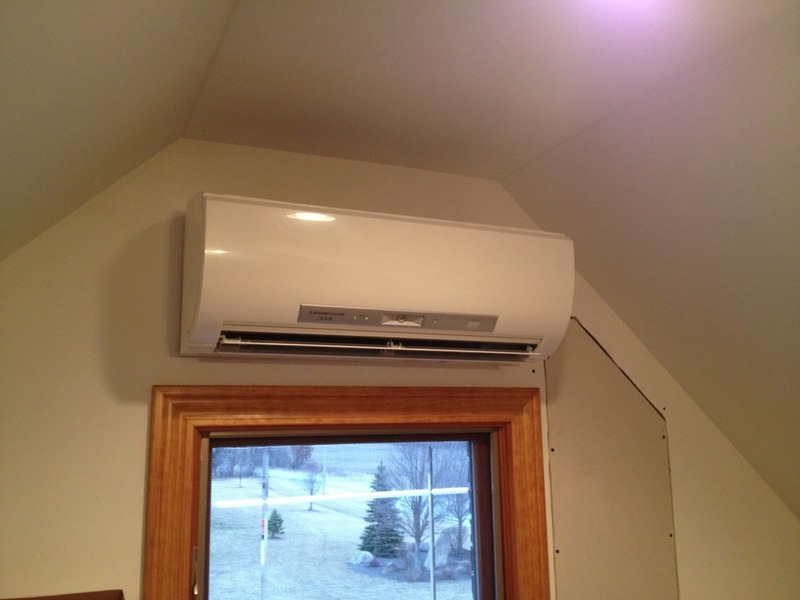 I took my own advice and installed a ductless mini-split system. A ductless system is really the perfect fit for my application. I have a finished area that has wildly different heating and cooling loads that the adjacent areas, but it isn't really all that large an area that would require a completely seperate furnace and air conditioner. 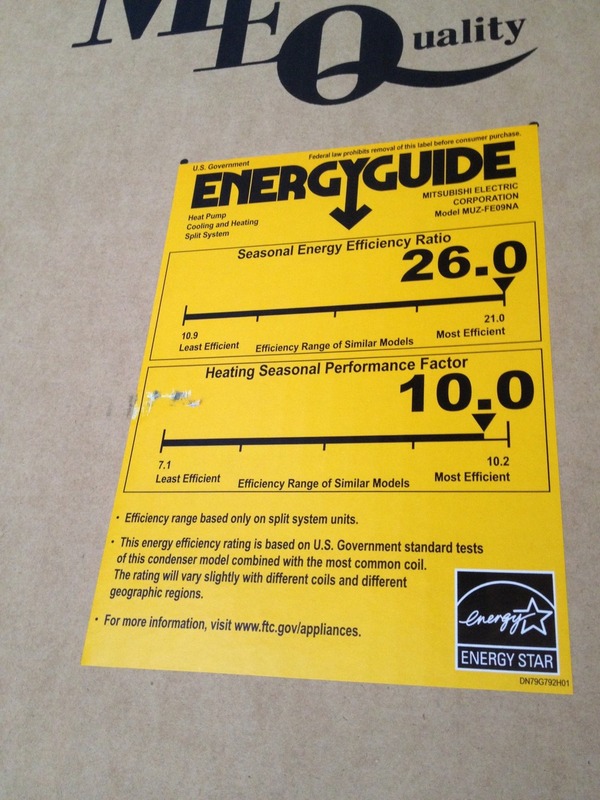 The model I chose to install is the Mitsubishi FE09 Heat pump. The system consists of an inside unit that mounts on the wall and an outside unit that houses the compressor. I chose to open up the drywall and run the refrigerant lines, drain, and control wiring inside rather than outside which made the project take a little longer but will result in a very high WAF (wife acceptance factor) when everything is done. The system is extremely efficient and provides both heating and cooling. Because it uses a variable speed compressor, the unit only runs as fast or slow as it needs to achieve the temperature. As a result the unit is also extremely quiete (watch this space for a video comparing this unit to our whole-house air conditioner). The resuls of the project are almost unbelievably comfortable temperatures in the bonus room and we now have a space that we can truly use. We can now say that we have extra space that is a "Bonus" rather than a hot or cold room that we happen to store the toys in. Check out the pictures below for how it all turned out.